A stress fracture, or break, is the partial or incomplete fracture of a bone that results from a working force (or stress as it is usually called) being repeatedly applied to a localized area of the bone. It is important to note that stress fractures by definition are not fractures that take place because of one single event of damage, but instead is due to an accumulation of events, each of which on their own is not strong enough to break the bone. Stress fractures are therefore usually termed overuse injuries. The human skeleton, being the body’s internal support, has to withstand deformation as it is constantly exposed to external forces throughout its lifetime. These forces, when talking about a unit area on the bone, are referred to as stress. The bone itself is an elastic, living organ that can bend slightly, much like the bark of a tree, and if the force applied does not take the bone outside of its elastic range then once the force is removed the bone returns to its original position. Accumulation of stress on the bones, however, can lead to bone strain and micro-damages. In order to repair these damages, as well as be able to adapt to changes in working load applied on the bone, the bone continually goes through a process of remodelling, where old bones are replaced by new ones in order to optimize the structure according to present demands. Remodelling, which occurs in micro-cavities in the bone, always starts with old bone removal and then proceeds to new bone formation, and starts almost as soon as damage occurs. The entire process, however, takes approximately 2-8 months, with much of the time spent on bone formation. Consequently, there is a period of time where the site of remodelling is temporarily weakened after bone removal. If there is an imbalance in damage generation and damage removal where the remodelling process isn’t given sufficient time to repair damages before applying more stress to the site, this would lead to an accumulation of damage and can ultimately result in stress fractures. Overall, activities that increase the magnitude of the applied stress or the frequency at which it occurs may contribute to progression to a stress fracture. It is interesting to note that stress fractures in the lower extremities account for 80-90% of all stress fractures. Sports apply stress to the body; therefore regular participation in sports raises the risk of stress fractures. Stress fractures are very site-specific and occur in sites that are repeatedly exposed to a working load. Different athletes are therefore at risk of different stress fracture risks because of the difference in loading pattern. In running, sprinters, hurdlers and high- and long-jumpers apply a greater magnitude of the load to their feet more than middle and long-distance runners, and hence are more at risk of getting a stress fracture in that area. Long distance runners, however, are at higher risk of getting stress fractures in areas such as the shinbone and pelvis because the load is applied repeatedly at high volumes in that area. Even though stress fractures in the upper extremities are less common, for sports that involve throwing or other overhead movement increase risk for this type of injury. For rowers, the load is repeatedly applied to the rib cage during the rowing stroke. if there is insufficient time to adapt to an increased intensity in a training routine, the additional damage might take place. It’s been reported that up to 86% of injured athletes had changed their training routine just prior to a stress fracture. Muscles act as active shock absorbers and hence protect bones from stress fractures. If muscles are fatigued or weakened, however, their ability to protect the skeleton is compromised and there is an increased risk of stress fractures. Feet with a high arch have less shock absorbing capacity, and so the applied force can be transmitted up the leg, putting those with high arches at risk of stress fractures in the shin and thigh bone. Flat feet, in comparison, are more shock absorbing, and therefore stress fractures tend to be in the feet. Several studies in military recruits, which is another group of people well known to be at increased risk of stress fractures, have found that persons that have a long history of regular exercise had decreased the incidence of stress fractures during basic training. In one study, persons that had played ball sports regularly at least 2 years before recruitment had incidence rates of stress fractures (13%, 17% and 4% from three different studies) that were generally less than half of the incidence rates for those that did not play ball sports (29%, 27% and 19% respectively). This was suspected to be due to the increase in bone stiffness and hence bone resistance to damage7. Poor nutrition and deficient calorie intake have been found to increase the risk of stress fractures by negatively affecting bone turnover. Females in the military have been found to be at higher risk for stress fractures than men. Research for those in the athletic population doesn’t show this relationship, however with risk being the same or only slightly higher in females. Theories on why females would be more at risk go back to nutrition; females that restrict calorie intake and have an eating disorder are more at risk of stress fractures. Other risk factors include smoking, increased alcohol intake and use of a poor training surface. Pain, which varies in location based on where the stress fracture occurs. Someone with a tibial (or shinbone) fracture may have knee pains, while someone with a pelvic fracture may have groin pains. Pain with movement is very common. Edema (collection of watery fluid in body tissues and cavities) around the affected area. When diagnosing stress fractures, based on the location, it is important to eliminate possibilities that present symptoms may be due to another medical condition instead. Stress fractures should be considered for persons that have had a recent increase in physical activity, or increased rate of activity with limited rest. 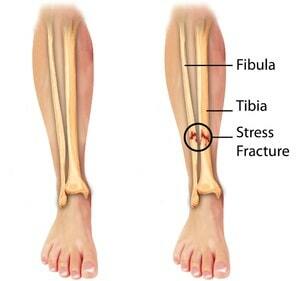 This is a common way for diagnosing the stress fracture. In the hop test, the patient is instructed to hop on one leg to see if this action causes severe localized pain. Patients with medial tibial stress syndrome, however, may also test positive using this method. Another common method is placing a tuning fork at the site to produce localized pain. For the two methods above, recent literature provides little supporting evidence as to their accuracy. Plain radiography imaging should be the first consideration for imaging in a suspected case of a stress fracture. Radiography is usually negative when initially done, but is likely to become positive once time passes. Therefore, if the diagnosis is not urgent, if the first radiography is negative, the second radiography should be done two to three weeks later. This was previously the confirmation test for stress fractures in most studies because of its high sensitivity. It exposes the patient to low levels of radiation, however, and may produce a false negative if there is an infection or tumour present. MRI is now the confirmation test used for most studies. It provides equal sensitivity as the scintigraphy, but higher specificity thereby eliminating the issue of false positives. Experts state that MRI can be considered if plain radiography is negative. It may also be useful in early detection of stress damage before a stress fracture happens. MRI, however, carries the highest price for imaging which is its main downfall. Treatment should begin as soon as a stress fracture is suspected, as it’s been observed that delayed treatment also delays recovery. Treatment can take 4 to 12 weeks or longer, depending on the injury. The site of injury must first have restricted activity to the point where there is no pain. The RICE principle can be applied at the initial point of injury. Drugs such as acetaminophen and non-steroidal anti-inflammatory drugs may be prescribed for pain control, however, anti-inflammatory drugs should be used with caution, as animal studies have found that these drugs inhibit fracture healing. The use of crutches, stirrup leg braces, or other stress relieving measures may relieve pain and help with recovery time. To maintain flexibility, strength and physical fitness, physical therapy and cross training that will not aggravate the affected area during the recovery period may be considered. Surgery is another treatment option. Athletes in sports season may choose to reduce the level of activity to a point that can be tolerated and delay complete rest until the season is over, for the sake of their careers, but this may prolong recovery or cause fractures to reach a point where additional intervention, such as surgery, is needed. Some fractures are at high risk of leading to other complications, including becoming complete fractures, such as the femur neck in the thighbone, the kneecap, the shinbone, the anklebone, the long bone in the foot that connects to the little toe. In cases of high-risk fractures, a consultation with an orthopedist or sports medicine specialist may be needed. Romani, W. A., Gieck, J. H., Perrin, D. H., Saliba, E. N., and Kahler, D. M. (2002) Mechanisms and management of stress fractures in physically active persons, J Athl Train 37, 306-314. Warden, S. J., Burr, D. B., and Brukner, P. D. (2006) Stress fractures: pathophysiology, epidemiology, and risk factors, Curr Osteoporos Rep 4, 103-109. Salter, R. (1999) Textbook of Disorders and Injuries of the Musculoskeletal System, 3rd ed., Lippincott Williams & Wilkins, USA. Kini, U., and Nandeesh, B. N. (2012) Physiology of Bone Formation, Remodeling, and Metabolism Springer Berlin Heidelberg. Bennell, K. L., Malcolm, S. A., Thomas, S. A., Wark, J. D., and Brukner, P. D. (1996) The incidence and distribution of stress fractures in competitive track and field athletes. A twelve-month prospective study, Am J Sports Med 24, 211-217. Sullivan, D., Warren, R. F., Pavlov, H., and Kelman, G. (1984) Stress fractures in 51 runners, Clin Orthop Relat Res, 188-192. Milgrom, C., Simkin, A., Eldad, A., Nyska, M., and Finestone, A. (2000) Using bone’s adaptation ability to lower the incidence of stress fractures, Am J Sports Med 28, 245-251. Patel, D. S., Roth, M., and Kapil, N. (2011) Stress fractures: diagnosis, treatment, and prevention, American family physician 83, 39-46.